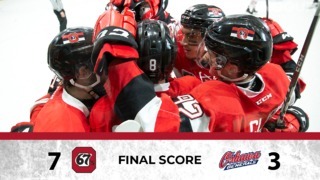 Playing the second half of a back to back against the Oshawa Generals on Saturday afternoon, the Ottawa 67’s made quite the impression, this time on national television, defeating the Gens 4-0 in a Sportsnet CHL Showcase game. Tye Felhaber scored his 50th goal of the season, followed by goals from Merrick Rippon, Marco Rossi and Graeme Clarke in the Barber Poles’ winning effort. Andree stopped 38 pucks for his third shutout of the season, in his league-leading 27th win. 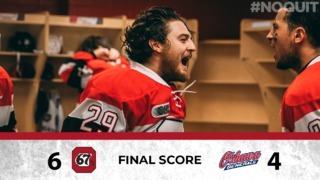 Felhaber opened the scoring early in the game on the power play, becoming the first OHL player to score 50 and the first Ottawa 67’s player to do so since Tyler Toffoli. Merrick Rippon added another goal halfway through the first period to give his team a two-goal advantage. The second period was held scoreless, largely in part to Cedrick Andree’s great play. After forty minutes, Ottawa was being outshot 29-16 by their rivals. Marco Rossi and Graeme Clarke both added goals in the third period, confirming the 67’s fourth straight win. 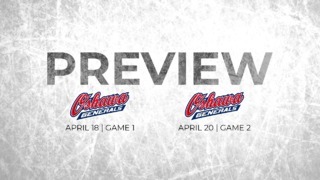 The Barber Poles will be back in action as soon as tomorrow afternoon when they host the Saginaw Spirit at The Arena at TD Place; puck drop is scheduled for 2:00 PM. Now with 50 goals in 47 games, Tye Felhaber is currently on pace towards a 72-goal season. With an assist today, Lucas Chiodo has now put up 6 points in his last 3 games. The other newcomer, Kyle Maksimovich, is also currently doing well. Maksimovich has 5 points in his last 2 contests. The penalty kill was stellar today for the Barber Poles, stopping Oshawa on all 6 of their power play attempts.